3. Wilhelm Schubert speaks from the dock at the Sachsenhausen concentration camp war crimes trial in Berlin. 6. View of the courtroom at the Sachsenhausen concentration camp war crimes trial in Berlin. 9. The Soviet Military Tribunal at the Sachsenhausen concentration camp war crimes trial in Berlin. 10. The members of defense team sit in front of the defendants dock at the Sachsenhausen concentration camp war crimes trial in Berlin. 11. 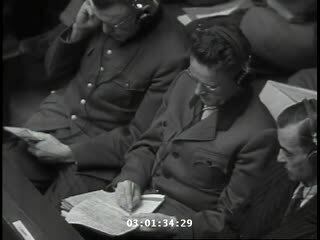 The head of the Soviet Military Tribunal reads a statement to the defendants and their lawyers at the Sachsenhausen concentration camp war crimes trial in Berlin. 12. The head of the Soviet Military Tribunal reads a statement at the Sachsenhausen concentration camp war crimes trial in Berlin. 13. The head of the Soviet Military Tribunal at the Sachsenhausen concentration camp war crimes trial in Berlin. 14. The defendants sit in the dock at the Sachsenhausen concentration camp war crimes trial in Berlin. 15. The defendants (right), their lawyers (center), and the Soviet Military Tribunal (back left) at the Sachsenhausen concentration camp war crimes trial in Berlin. 16. The defendants are led into the courtroom at the Sachsenhausen concentration camp war crimes trial in Berlin. 17. The defendants and their lawyers at the Sachsenhausen concentration camp war crimes trial in Berlin. 18. The building in Berlin where the Sachsenhausen concentration camp war crimes trials were held.